Primary Heating Equipment installed by A.J. 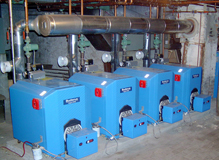 Petrunis, Inc.
Boilers heat water to be circulated through piping for home heating systems. 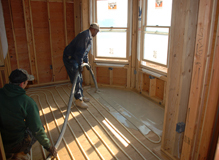 Examples of hydronic heating systems include radiators, convectors, radiant tube or baseboard. 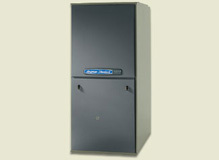 A forced air heating system draws air from the home into a furnace, where it is heated and blown back via ductwork. Radiant Heat is one of the most efficient ways to heat warehouses, garages, storerooms, and other large facilities as well as your home. It delivers heat directly from the floor level, designed to be felt, not seen or heard. 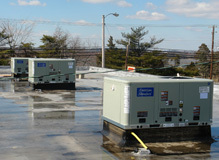 Primary Air Conditioning Equipment installed by A.J. 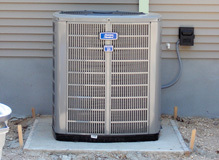 Petrunis, Inc.
Air conditioners cool, filter, and dehumidify a room, offering much needed relief from the summer heat.